"WinCE iSCSI Initiator can be used over existing wired and wireless (Wi-Fi, 3G, 4G etc.) networks to create storage area networks (SANs). That will help iSCSI Initiator device to expand their virtual storage without any additional hardware requirements which is a huge benefit for home and business solutions." Most of our articles these days are focused on the Windows Phone 7 platform and ecosystem, but if you are still working away in the Windows Mobile "legacy" environment (and there are lots of you out there! ), then you may be interested in this free app. 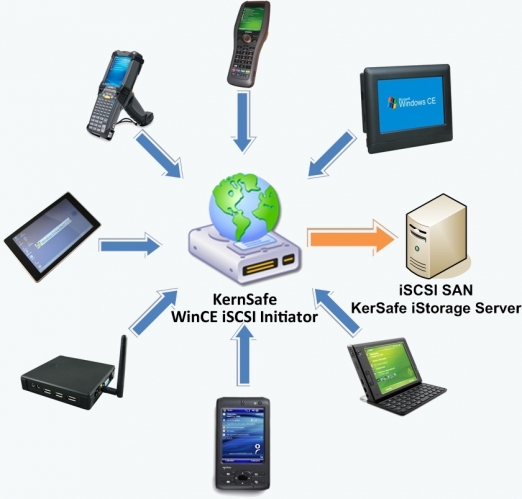 WinCE iSCSI Initiator helps to connect your mobile device to network-based storage to create a storage area network. The product enables connection to a computer that is running any iSCSI SAN, like iStorage Server, from any Windows CE based device. It can be can be used over existing wired or wireless (Wi-Fi, 3G, 4G, etc.) networks and can be installed on any Windows Embedded device or Windows Mobile phone.